"Guerrilla" and "Guerrilla War" redirect here. For other uses, see Guerrilla (disambiguation). Not to be confused with Gorilla Warfare. 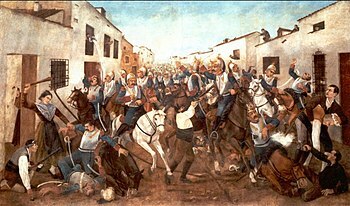 Spanish guerrilla resistance to the Napoleonic French invasion of Spain in 1808, where the term "guerrilla" was first used in warfare. Guerrilla warfare is a form of irregular warfare in which a small group of combatants, such as paramilitary personnel, armed civilians, or irregulars use military tactics including ambushes, sabotage, raids, petty warfare, hit-and-run tactics, and mobility, to fight a larger and less-mobile traditional military. Guerrilla groups are a type of violent non-state actor. The Spanish word "guerrilla" is the diminutive form of "guerra" ("war"). The term became popular during the early-19th century Peninsular War, when the Spanish and Portuguese people rose against the Napoleonic troops and fought against a highly superior army using the guerrilla strategy. In correct Spanish usage, a person who is a member of a "guerrilla" unit is a "guerrillero" ([ɣeriˈʎeɾo]) if male, or a "guerrillera" ([ɣeriˈʎeɾa]) if female. Guerrilla warfare is a type of asymmetric warfare: competition between opponents of unequal strength. It is also a type of irregular warfare: that is, it aims not simply to defeat an enemy, but to win popular support and political influence, to the enemy's cost. Accordingly, guerrilla strategy aims to magnify the impact of a small, mobile force on a larger, more-cumbersome one. If successful, guerrillas weaken their enemy by attrition, eventually forcing them to withdraw. At least one author credits the ancient Chinese work The Art of War with inspiring Mao's tactics.:pp. 6–7 In the 20th century, other communist leaders, including North Vietnamese Ho Chi Minh, often used and developed guerrilla warfare tactics, which provided a model for their use elsewhere, leading to the Cuban "foco" theory and the anti-Soviet Mujahadeen in Afghanistan. In addition to traditional military methods, guerrilla groups may rely also on destroying infrastructure, using improvised explosive devices, for example. They typically also rely on logistical and political support from the local population and foreign backers, are often embedded within it (thereby using the population as a human shield), and many guerrilla groups are adept at public persuasion through propaganda. Many guerrilla movements today also rely heavily on children as combatants, scouts, porters, spies, informants, and in other roles, which has drawn international condemnation (although many states also recruit children into their armed forces). There is no commonly accepted definition of "terrorism", and the term is frequently used as a political tactic by belligerents (most often by governments in power) to denounce opponents whose status as terrorists is disputed. Contrary to some terrorist groups, guerrillas usually work in open positions as armed units, try to hold and seize land, do not refrain from fighting enemy military force in battle and usually apply pressure to control or dominate territory and population. While the primary concern of guerrillas is the enemy's active military units, terrorists largely are concerned with non-military agents and target mostly civilians. Guerrilla forces principally fight in accordance with the law of war (jus in bello). In this sense, they respect the rights of innocent civilians by refraining from targeting them. According to the Ankara Center for Crisis and Policy Studies, terrorists do not limit their actions and terrorise civilians by putting fear in people's hearts and even kill innocent foreigners in the country. "used by the side which is supported by a majority but which possesses a much smaller number of arms for use in defense against oppression". Sebastiaan Vrancx and Jan Brueghel the Elder's painting depicts "An assault on a convoy" during the Dutch Revolt – effectively an instance of guerrilla warfare, though the term did not yet exist. Quintus Fabius Maximus Verrucosus, widely regarded as the "father of guerrilla warfare", devised the Fabian strategy which was used to great effect against Hannibal Barca's army. The strategy would further influence guerrilla tactics into the modern era. 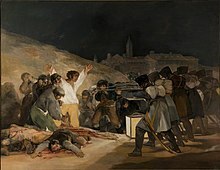 The Third of May 1808 by Francisco Goya, showing Spanish resisters being executed by Napoleon's troops during the Peninsular War. Polish guerrillas from Batalion Zośka dressed in captured German uniforms and armed with captured weapons, fighting in the Warsaw Uprising. A counter-insurgency or counterinsurgency (COIN) operation involves actions taken by the recognised government of a nation to contain or quell an insurgency taken up against it. In the main, the insurgents seek to destroy or erase the political authority of the defending authorities in a population they seek to control, and the counter-insurgent forces seek to protect that authority and reduce or eliminate the supplanting authority of the insurgents. Counter-insurgency operations are common during war, occupation and armed rebellions. Counter-insurgency may be armed suppression of a rebellion, coupled with tactics such as "hearts and minds" designed to fracture the links between the insurgency and the population in which the insurgents move. Because it may be difficult or impossible to distinguish between an insurgent, a supporter of an insurgency who is a non-combatant, and entirely uninvolved members of the population, counter-insurgency operations have often rested on a confused, relativistic, or otherwise situational distinction between insurgents and non-combatants. Theorists of counter-insurgency warfare have written extensively on the subject since the 1950s and 1960s but as early as the 1720s the third Marques of Santa Cruz de Marcenado (1684–1732) wrote that insurgencies were often the result of state failure and that the goal of those fighting the insurgents should be to seek the people's "heart and love". The two most influential of scholars of counter-insurgency have been Westerners whose job it had been to fight insurgents (often colonised people). Robert Thompson fought during the Malayan Emergency and David Galula fought during the Algerian War. Together these officers advocated multi-pronged strategies to win over the civilian population to the side of the counter-insurgent. The widely distributed and influential work of Sir Robert Thompson, counter-insurgency expert of the Malayan Emergency, offers several such guidelines. Thompson's underlying assumption was that the counter-insurgent was committed to improving the rule of law and bettering local governance. Some governments, however, give such considerations short shrift. These governments are not interested in state-building and in extreme cases they have carried out counter-insurgency operations by using mass murder, genocide, terror, torture and execution. Historian Timothy Snyder has written, "In the guise of anti-partisan actions, the Germans killed perhaps three quarters of a million people, about 350,000 in Belarus alone, and lower but comparable numbers in Poland and Yugoslavia. The Germans killed more than a hundred thousand Poles when suppressing the Warsaw Uprising of 1944." 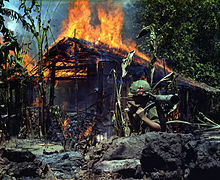 In the Vietnam War, the Americans "defoliated countless trees in areas where the communist North Vietnamese troops hid supply lines and conducted guerrilla warfare", (see Operation Ranch Hand). In the Soviet–Afghan War, the Soviets countered the U.S.–backed Mujahideen with a 'Scorched Earth' policy, driving over one third of the Afghan population into exile (over 5 million people), and carrying out widespread destruction of villages, granaries, crops, herds and irrigation systems, including the deadly and widespread mining of fields and pastures. Some writers on counter-insurgency warfare emphasise the more turbulent nature of today's guerrilla warfare environment, where the clear political goals, parties and structures of such places as Vietnam, Malaysia, and El Salvador are not as prevalent. These writers point to numerous guerrilla conflicts that centre around religious, ethnic or even criminal enterprise themes, and that do not lend themselves to the classic "national liberation" template. Insurgents may not be seeking to overthrow the state, may have no coherent strategy or may pursue a faith-based approach difficult to counter with traditional methods. There may be numerous competing insurgencies in one theater, meaning that the counterinsurgent must control the overall environment rather than defeat a specific enemy. The actions of individuals and the propaganda effect of a subjective "single narrative" may far outweigh practical progress, rendering counterinsurgency even more non-linear and unpredictable than before. The counterinsurgent, not the insurgent, may initiate the conflict and represent the forces of revolutionary change. The economic relationship between insurgent and population may be diametrically opposed to classical theory. And insurgent tactics, based on exploiting the propaganda effects of urban bombing, may invalidate some classical tactics and render others, like patrolling, counterproductive under some circumstances. Thus, field evidence suggests, classical theory is necessary but not sufficient for success against contemporary insurgencies. Why does the guerrilla fighter fight? We must come to the inevitable conclusion that the guerrilla fighter is a social reformer, that he takes up arms responding to the angry protest of the people against their oppressors, and that he fights in order to change the social system that keeps all his unarmed brothers in ignominy and misery. In the 1960s, the Marxist revolutionary Che Guevara developed the foco (Spanish: foquismo) theory of revolution in his book Guerrilla Warfare, based on his experiences during the 1959 Cuban Revolution. This theory was later formalised as "focal-ism" by Régis Debray. Its central principle is that vanguardism by cadres of small, fast-moving paramilitary groups can provide a focus for popular discontent against a sitting regime, and thereby lead a general insurrection. Although the original approach was to mobilise and launch attacks from rural areas, many foco ideas were adapted into urban guerrilla warfare movements. ^ Tomes, Robert (Spring 2004). "Relearning Counterinsurgency Warfare" (PDF). Parameters. Archived from the original (PDF) on 7 June 2010. ^ Mao Tse-tung, "A Single Spark Can Start a Prairie Fire", Selected Works, Eng. ed., FLP, Peking, 1965, Vol. I. ^ a b McNeilly, Mark. Sun Tzu and the Art of Modern Warfare, 2003, p. 204. "American arming and support of the anti-Soviet Mujahadeen in Afghanistan is another example." ^ Detsch, J (11 July 2017). "Pentagon braces for Islamic State insurgency after Mosul". Al-Monitor. Archived from the original on 12 July 2017. Retrieved 24 January 2018. ^ Child Soldiers International (2016). "A law unto themselves? Confronting the recruitment of children by armed groups". Retrieved 19 January 2018. ^ United Nations Secretary-General (2017). "Report of the Secretary-General: Children and armed conflict, 2017". www.un.org. Retrieved 24 January 2018. ^ Child Soldiers International (2012). "Louder than words: An agenda for action to end state use of child soldiers". Retrieved 19 January 2018. ^ Emmerson, B (2016). "Report of the Special Rapporteur on the promotion and protection of human rights and fundamental freedoms while countering terrorism" (PDF). www.un.org. Retrieved 24 January 2018. ^ Halibozek, Edward P.; Jones, Andy; Kovacich, Gerald L. (2008). The corporate security professional's handbook on terrorism (illustrated ed.). Elsevier (Butterworth-Heinemann). pp. 4–5. ISBN 978-0-7506-8257-2. Retrieved 17 December 2016. ^ Williamson, Myra (2009). Terrorism, war and international law: the legality of the use of force against Afghanistan in 2001. Ashgate Publishing. ISBN 978-0-7546-7403-0. ^ Sinclair, Samuel Justin; Antonius, Daniel (7 May 2012). The Psychology of Terrorism Fears. Oxford University Press, USA. ISBN 978-0-19-538811-4. ^ Rowe, P (2002). "Freedom fighters and rebels: the rules of civil war". J R Soc Med. 95 (1): 3–4. doi:10.1258/jrsm.95.1.3. PMC 1279138. PMID 11773342. ^ "The Differences Between the Guerrilla Warfare and Terrorism". 25 September 2017. ^ Guevara, Ernesto; Loveman, Brian; Thomas m. Davies, Jr (1985). Guerrilla Warfare. ISBN 9780842026789. ^ Leonard, Thomas M., Encyclopedia of the developing world, 1989, p. 728. "One of the earliest proponents of guerrilla war tactics is the Chinese master of warfare, Sun Tzu." ^ Snyder, Craig. Contemporary security and strategy, 1999, p. 46. "Many of Sun Tzu's strategic ideas were adopted by the practitioners of guerrilla warfare." "Primitive (and guerrilla) warfare consists of war stripped to its essentials: the murder of enemies; the theft or destruction of their sustenance, wealth, and essential resources; and the inducement in them of insecurity and terror. It conducts the basic business of war without recourse to ponderous formations or equipment, complicated maneuvers, strict chains of command, calculated strategies, time tables, or other civilized embellishments." ^ Boot, Max (2013). Invisible Armies: An Epic History of Guerrilla Warfare from Ancient Times to the Present. Liveright. pp. 10–11, 55. ISBN 978-0-87140-424-4. ^ a b Laqueur, Walter (1976). Guerrilla Warfare: A Historical & Critical Study. Transaction Publishers. p. 7. ISBN 978-0-76-580406-8. ^ Joseph J. Ellis (2004). His Excellency. Vintage Books. pp. 92–109. ISBN 978-1-4000-3253-2. ^ Laqueur, Walter (1976). Guerrilla Warfare: A Historical & Critical Study. Transaction Publishers. p. 7. ISBN 978-0-7658-0406-8. ^ Excerpts from Santa Cruz's writings, translated into English, in Beatrice Heuser: The Strategy Makers: Thoughts on War and Society from Machiavelli to Clausewitz (Santa Monica, California: Greenwood/Praeger, 2010), ISBN 978-0-275-99826-4, pp. 124-146. ^ Snyder, Timothy. "Holocaust: The Ignored Reality"
^ Failoa, Anthony (13 November 2006). "In Vietnam, Old Foes Take Aim at War's Toxic Legacy". The Washington Post. Retrieved 31 October 2011. ^ Kilcullen, David. "Counter-insurgency Redux"
Derradji Abder-Rahmane, The Algerian Guerrilla Campaign Strategy & Tactics, the Edwin Mellen Press, New York, USA, 1997. Oller, John. The Swamp Fox: How Francis Marion Saved the American Revolution. Boston: Da Capo Press, 2016. ISBN 978-0-306-82457-9. Peers, William R.; Brelis, Dean. Behind the Burma Road: The Story of America's Most Successful Guerrilla Force. Boston: Little, Brown & Co., 1963. Polack, Peter. Guerrilla Warfare; Kings of Revolution Casemate,ISBN 9781612006758. Schmidt, LS. 1982. "American Involvement in the Filipino Resistance on Mindanao During the Japanese Occupation, 1942-1945". M.S. Thesis. U.S. Army Command and General Staff College. 274 pp. Wikimedia Commons has media related to Guerrilla warfare. Look up guerrilla in Wiktionary, the free dictionary. Insurgency Research Group – Multi-expert blog dedicated to the study of insurgency and the development of counter-insurgency policy.